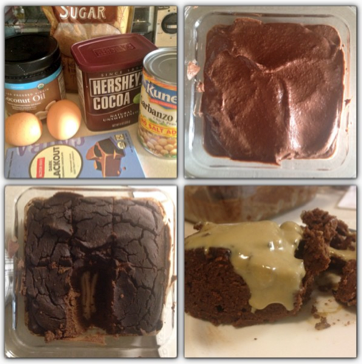 Food and Iron: Claudia's BROWNIES: Raw and Chickpea options! Today the beautiful Claudia is back with two healthy and yummy recipes!! Are you ready? Today I’ll share not just one, but two amazing brownies recipes!!! They are easy to make, delicious and 100% guilt-free! Another blogger friend shared this recipe with me and it blew my mind. The result is a very rich and intense chocolate brownie, perfect for those days when too sweet is not sweet enough! - 1 1/4 cup raw cacao powder. Mix all the ingredients with your hands and press into a 9x9 square glass Pyrex pan. Refrigerate at least one hour, cut into squares and enjoy! If you can't find date paste just make your own. : for one cup, soak 20 pitted dates in warm water until they are soft. Combine them in a food processor with a tbsp of water until they've become a thick whipped and creamy texture. Yummmm! These deliciousness will satisfy your chocolate cravings in a matter of seconds! I got the recipe a loooong time ago… I think from somewhere on Instagram! Mix everything in a blender and then put the mix in a glass container and into the oven at 350 degrees for around 28 min. I always top them with all some nut butter, for example natural sunflower seed butter… out of this world!! I really want to incorporate chickpea and chestnut flours in my sporadic baking! I love coconut flour, but it's time to branch out ! !